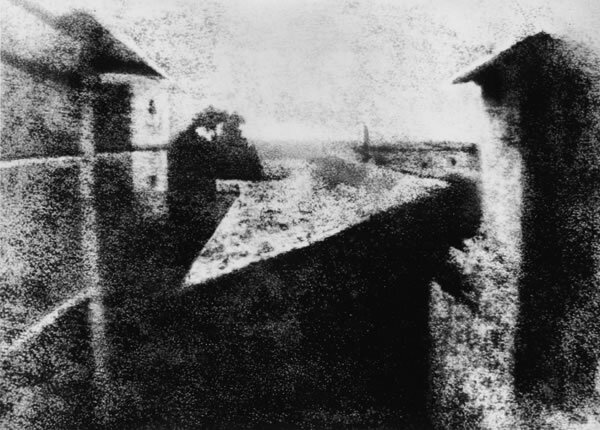 Long before the first public announcements of photographic processes in 1839, Joseph Nicéphore Niépce, a scientifically-minded gentleman living on his country estate near Chalon-sur-Saône, France, began experimenting with photography. Fascinated with the craze for the newly-invented art of lithography which swept over France in 1813, he began his initial experiments by 1816. Unable to draw well, Niépce first placed engravings, made transparent, onto stones coated with light-sensitive varnish of his own composition. These experiments, together with his application of the then-popular optical instrument, the camera obscura, would eventually lead him to the invention of the new medium. In 1824 Niépce met with some degree of success in copying engravings, but it would be two years later before he utilized pewter plates as the support medium for the process. By the summer of that year, 1826, Niépce was ready. In the window of his upper-story workroom at his country house, Le Gras, he set up a camera obscura, placed within it a polished pewter plate coated with bitumen of Judea (an asphalt derivative of petroleum), and uncapped the lens. After a day-long exposure of eight hours, the plate was removed and the latent image of the view from the window was rendered visible by washing it with a mixture of oil of lavender and white petroleum, which dissolved away the parts of the bitumen that had not been hardened by light. The result was the permanent direct positive picture you see here—a one-of-a-kind photograph on pewter. It renders a view of the outbuildings, trees and landscape as seen from that upstairs window. An ultimately doomed attempt to interest the Royal Society in his process—which he called "Heliography"—brought Niépce and the first photograph to England in 1827. Upon his return to France later that year, he left his precious artifact with his host, the British botanist Sir Francis Bauer, who dutifully recorded the inventor's name and additional information on the paper backing of the frame that held the unique plate. Niépce formed a partnership with the French artist, Louis Jacques Mandé Daguerre, in 1829, but produced little more work and died, his contributions chiefly unrecognized, in 1833. Thereafter, the nineteenth century would see the first photograph pass from Bauer's estate and through a variety of hands. After its last public exhibition in 1898, it slipped into obscurity and did not surface for over half a century. It was only in 1952 that the photohistorian, Helmut Gernsheim, was able to follow the clues, establish the work's provenance, and discover where family members of the plate's last recorded owner had forgotten that it was stored away. He verified the photograph's authenticity, obtained it for his collection, and returned Joseph Nicéphore Niépce to his rightful place as the world's first photographer. When Harry Ransom purchased the Gernsheim Collection for The University of Texas at Austin in 1963, Helmut Gernsheim subsequently donated the Niépce heliograph to the institution. The Niépce heliograph—the world's earliest extant permanent photograph from nature—forms the cornerstone not only to UT's Photography Collection but also to the process of photography which has revolutionized our world throughout the last one and one-half centuries. Because of its uniqueness and its significance to the arts and humanities, it is among the world's and the University's rarest treasures. This most famous reproduction of the World's First Photograph was based upon the March 1952 reproduction produced at Helmut Gernsheim's request by the Research Laboratory of the Eastman Kodak Company in London. The pointillistic effect is due to the reproduction process and is not present in the original heliograph. The Kodak reproduction was touched up with watercolors by Gernsheim himself in order to bring it as close as possible to his approximation of how he felt the original should appear in reproduction. The World's First Photograph, housed in its original presentational frame and sealed within an atmosphere of inert gas in an airtight steel and Plexiglas storage frame, must be viewed under controlled lighting in order for its image to be visible. In general, this procedure requires viewing the plane of the pewter plate at an angle of approximately 30° to the perpendicular and in exact opposition to a point source of light, preferably within a darkened environment free of other incidental light sources. The view, made from an upper, rear window of the Niépce family home in Burgundy, represents (from left to right): the upper loft (or, so-called "pigeon-house") of the family house; a pear tree with a patch of sky showing through an opening in the branches; the slanting roof of the barn, with the long roof & low chimney of the bake house behind it; and, on the right, another wing of the family house. Details in the original image are very faint, due not to fading—the heliographic process is a relatively permanent one—but rather to Niépce's underexposure of the original plate. First printed in the WAAC Newsletter, Vol. 24, Number 3, September 2002, with the permission of Harry Ransom Humanities Research Center, The University of Texas at Austin.